A set of six colors, including Black, Red, Blue, Green, Brown, and Yellow. How can I fix the bleach spots on my favorite clothing? It happens to almost everyone who ever uses bleach: you pour bleach for some other task, a small spot lands on your clothes, and you don't notice it until it's too late - you have a light spot on a favorite garment. Acne medicine can do the same thing! How can you fix it? It's often not possible to cover up a spot by dyeing the whole garment. Dye is transparent, and the final color is the sum of the original color plus the added color, so any light spots before dyeing will still be lighter after dyeing. However, I have dyed some towels a very dark shade of purple (using good dye, Procion MX, not all purpose dye) - and found that the original lighter spots were completely invisible - even after I decided they were too dark and lightened the resulting color with a bit of Rit brand Color Remover - so you might get lucky. Furthermore, if you try a technique such as low water immersion dyeing, the results are not all one smooth shade of color anyway, so the spot is usually no longer a problem. It's only vat dyeing (also known as high-water immersion or washing-machine dyeing, which produces one smooth color, that is likely to allow the spot to show badly even after dyeing. One of the best solutions to the bleach spot problem is surprisingly low-tech. 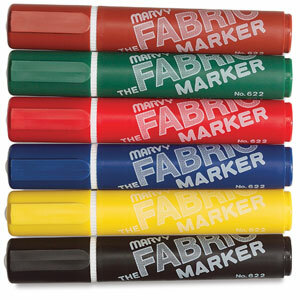 Just find a permanent marker, or better, a fabric marker, that closely matches the original color of the garment, and color in the spot. The results may be good enough to pass muster on their own, or they may require overdyeing but still give better results than overdyeing alone. The hard part is finding a marker that is the exact right shade, and yet which will not wash out. Marvy fabric pens are good, but Sharpie pens will sometimes do in a pinch. Be sure to hang on to the marker! If the marker washes out eventually, you'll need to apply touch-ups. Another way to avoid a light spot after dyeing is to bleach out the entire garment, so it all more-or-less matches, before dyeing. Rit Color Remover is an excellent product for this purpose. Chlorine bleach ought to work very well, since it's what got you into this mess in the first place, but be sure to avoid degrading the fabric. You must neutralize the chlorine bleach. Use Anti-chlor, afterwards, for the most economical, reliable, and non-damaging bleach remover, or use a strong oxygen bleach, such as OxyBoost, or other color-safe oxygen bleach, or even the 3% hydrogen peroxide that is sold as an antiseptic, to stop the degrading effects of the chlorine bleach. If you don't do this, the lifespan of the garment will be reduced as the chlorine bleach continues to eat away at the fiber. Of course, the original bleach spot probably sat for days, without benefit of Anti-chlor, before you even discovered the problem, so you can expect that spot to wear out and develop a hole long before the normal lifespan of the garment is up. There's not much to do about this after the fact, but if you happen to see the bleach spatter when it happens, quick action on your part with Anti-chlor or hydrogen peroxide may prevent a great deal of permanant damage. At the very least, plunge it into a large quantity of water and rinse thoroughly. Some people who are ignorant of chemistry advise the use of vinegar to remove bleach from fabric; unfortunately, the way it does so is by producing even more caustic chemicals, so this is not a wise approach.